This audio description has been compiled by Joe Turnbull in February 2018. It was commissioned by Disability Arts Online on behalf of NDACA (the National Disability Arts Collection and Archive). It is approximately 7 minutes long. 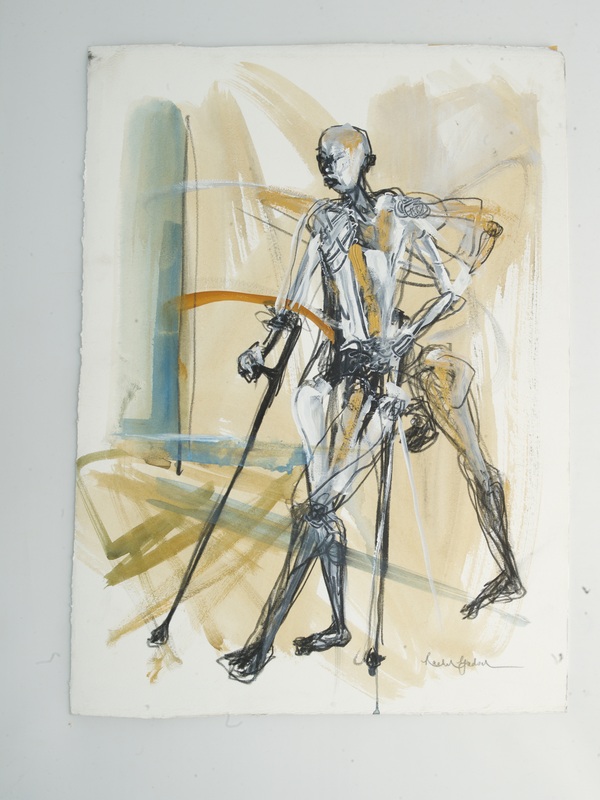 Strong Man of Khayelitsha is part drawing-part painting by Rachel Gadsden approximately 46 x 36 cm, in a combination of charcoal and gouache on 300gsm Somerset paper. It is an Expressionistic portrait of Thobani Ncapai [Pron To-BAA-nee N-CAP- I (as in high)], a South African Research Assistant from the University of Cape Town. Ncapai is depicted standing with a pair of crutches. His naked figure is made up of a furious collection of squiggled lines in black charcoal and shaded using white and tan-coloured gouache. This gives it a ghostly, ethereal quality. His upper body is depicted as very slender and he has no hair on his head. He is drawn with an almost defiant expression on his face. His right hand grasps a long, black crutch. It is a forearm crutch, with a cuff around the elbow. His left arm is drawn in multiple positions, giving the effect of movement. The left hand is difficult to make out but also holds a crutch. Ncapai’s legs are crossed in a relatively natural position as if he’s taking a step forward using the crutches. A third leg is shown behind his buttocks, as if this was the position of the leg before it was swung forwards. To the left of the picture is an ‘L’ shape in a greeny-blue, giving the impression of a door frame. A further sense of movement comes from a background of sweeping fat sandy-brown brushstrokes ranging across the paper behind Ncapai. The drawing was done in October 2011 in a small studio in Muizenberg, South Africa. It was part of Gadsden’s London 2012 Cultural Olympiad commission, Unlimited Global Alchemy, which involved a six-week collaborative residency with the Bambanani artist/activist Group of Khayelitsha Township, Cape Town. The Group formed in 2002 to participate in the creation of memory books and boxes aimed at helping people come to terms with their diagnosis, to disclose their HIV-status to their families and children and to begin the planning for the future. Typical of Gadsden’s artistic practice, Strong Man of Khayelitsha is not drawn from a live sitting, or a photograph but from the abstracted impression of the subject by the artist, after the event. Gadsden expands: “It’s about the essence of who he is. Even if I have models in front of me, I’ve become much more interested in an emotional response to what’s in front of me, rather than a literal description. As an artist, it’s a bonus of losing my sight, I feel my whole imagination and sense of creation has grown massively”. Recognising how fortunate he was to have received treatment for his condition, Ncapai helped set up a burial co-operative for migrant workers who came from the Eastern Cape into Cape Town for work. If a member of the co-operative died as a result of HIV/AIDS, the co-operative would help transport their bodies back to their hometown for burial. Ncapai came to the UK to see Unlimited Global Alchemy being exhibited in 2012. At the time of writing, Ncapai is still a Research Assistant at the Centre for Social Science Research, Cape Town University. Gadsden is still in regular contact with him. Strong Man of Khayelitsha is just one work among many in the Unlimited Global Alchemy collection that includes drawings, sketchbooks, paintings and a collection of six films each exploring a different member of the Bambanani Group. A live art performance co-directed by Gadsden and choreographer Athina Vahla, featuring performers Freddie Opoku-Addaie and Sarah Chin was also created as part of the project, as was a project catalogue, published by project producers, Artsadmin. The exhibition was initially on display at the Museum of Archaeology and Anthropology, Cambridge in June 2012, before going to Liverpool’s Bluecoat and London’s Southbank Centre in August and September, respectively. Aspects of the exhibition also went to Qatar in 2013 for an Art & Disability Festival programme installed as part of a cross-cultural exchange. Gadsden is an award-winning visual and performance artist based in the UK who works across both the mainstream and disability art sectors. She spent the first twenty years of her life in the Middle East. Gadsden has a BA Fine Art Painting from Wimbledon School of Art and an MA Fine Art from City and Guilds of London Art School. In 2016 she was awarded an honorary doctorate from London South Bank University. Gadsden says her work considers “the most profound notions of what it is to be human”. Gadsden was awarded the National Diversity Award 2013: Positive Role Model for Disability, shortlisted for the European Diversity Awards 2014 – Hero of the Year and was awarded BreakThrough UK Award 2014 – Influencing disabled people’s participation in society. The Unlimited Global Alchemy website. Unlimited Global Alchemy by Rachel Gadsden, published in 2012 by Artsadmin. Interviews with Rachel Gadsden on Disability Arts Online. Direct conversations with Rachel Gadsden.